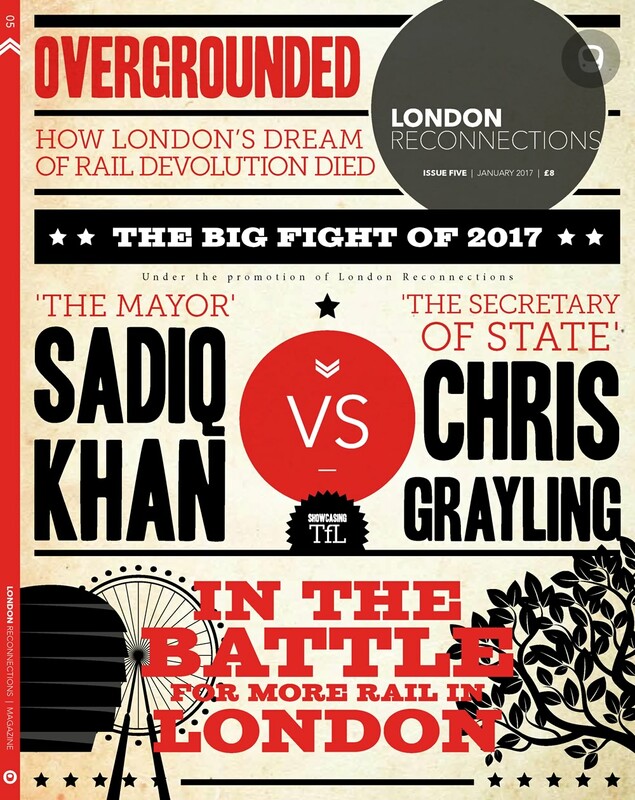 Since last year, a TfL/Travelwatch joint study into possible replacements for the South London Line has been underway. The Line itself is due to disappear in 2012 in order to pave the way for required works at London Bridge, and the previous intention had been to replace it with a new Victoria – Bellingham service. 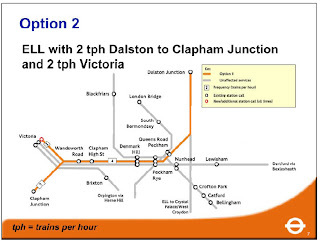 This service, however, is no longer to be implemented, as it became a victim of TfL’s need for additional DfT funding to complete phase 2 of the ELL Extension. In return for additional Central Government funding from the DfT for that project, the Victoria – Bellingham service was dropped. 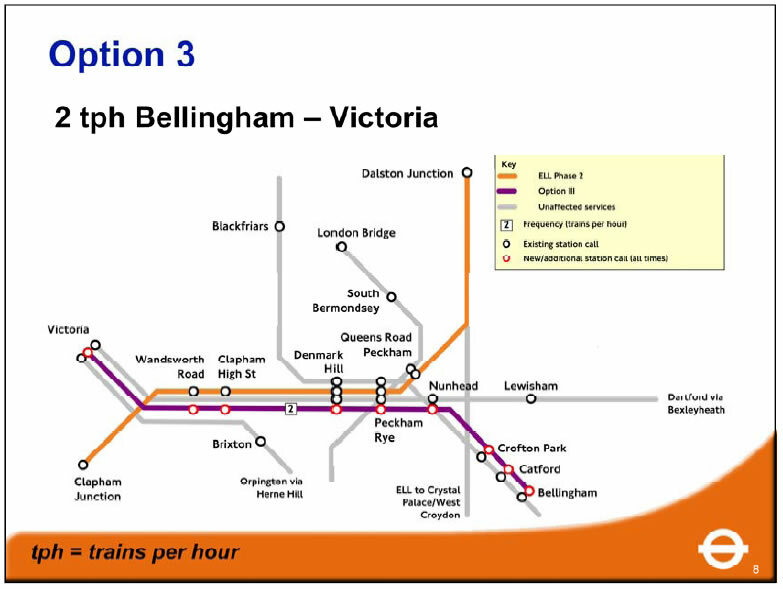 After the cancellation of Victoria – Bellingham was announced, both the Mayor and TfL agreed to look into other possible measures to mitigate the loss of the planned service (which the introduction of new ELL services would only partially compensate for). Key to this was an agreement to conduct a joint study with London Travelwatch into a number of possible options. This was initially due to report at the beginning of 2010, but had not manifested before the General Election was announced. Although the final report itself has yet to be made public, some of the details have begun to emerge, which we have looked to summarise below. A stakeholder meeting was also held on the 1st June to allow the findings to be presented to key groups and individuals, and thus it is possible that further details will emerge shortly. The TfL/Travelwatch study ultimately focussed on a shortlist of five overall service options. Interestingly, no London Bridge options appear to have made the final cut. The study appears to have concluded that it would be impossible to run any more services into the station from 2012 without having to displace other services that had greater passenger numbers. The shortlisted options therefore focus on possible services to Victoria, with an emphasis on increasing interchange options along the way. Summaries of the shortlisted options are below. This service would be operated by LOROL. 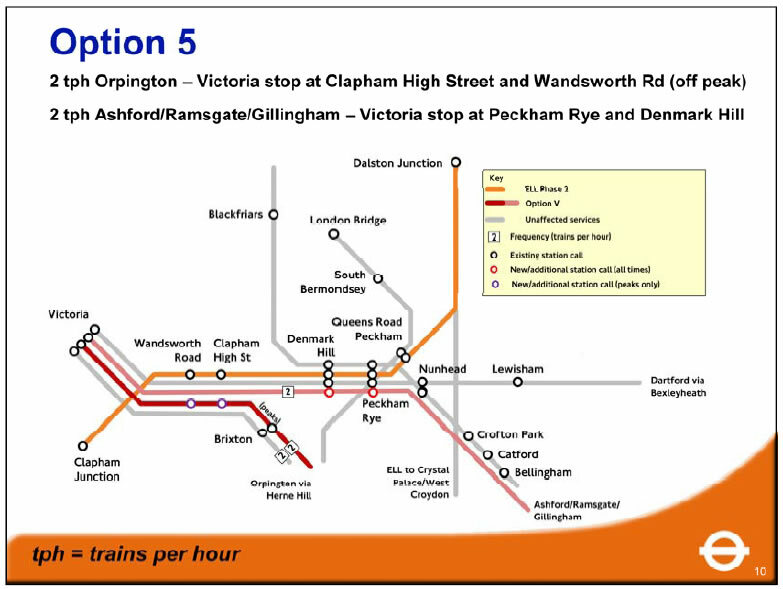 This option would ensure the current frequence of services between Peckham Rye/Denmark Hill were preserved, and would ensure that a direct link existed between Clapham High Street/Wandsworth Rd and Victoria all day. 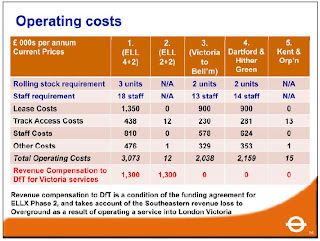 If LOROL run services into Victoria, then TfL have to pay the DfT compensation for “loss of revenue” on Southeastern services (this was a condition of the ELLX2 finance deal). Likely to be feasible although regular service may be difficult at peak times (although the study notes that 4 carriage trains would be a poor use of capacity at Victoria). 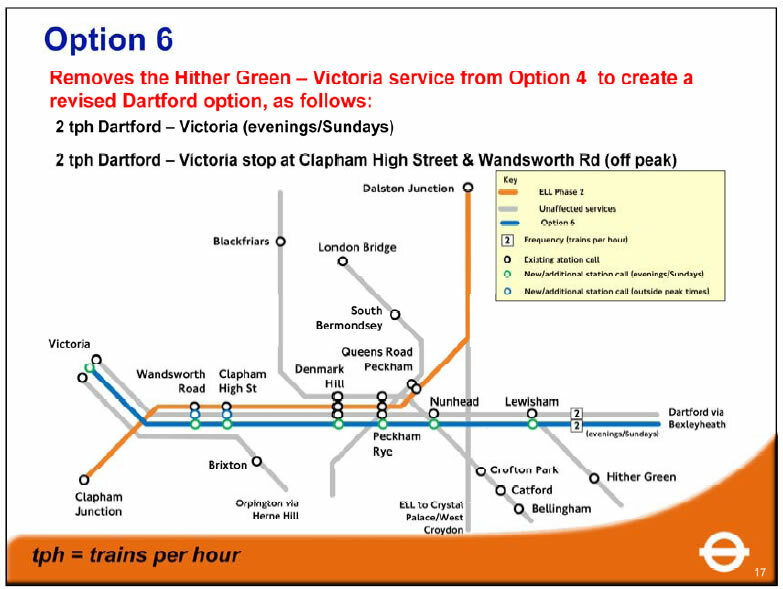 Again, this option would ensure the current frequence of services between Peckham Rye/Denmark Hill were preserved, and would ensure that a direct link existed between Clapham High Street/Wandsworth Rd and Victoria all day. Reduces interaction with freight in Clapham Junction area. 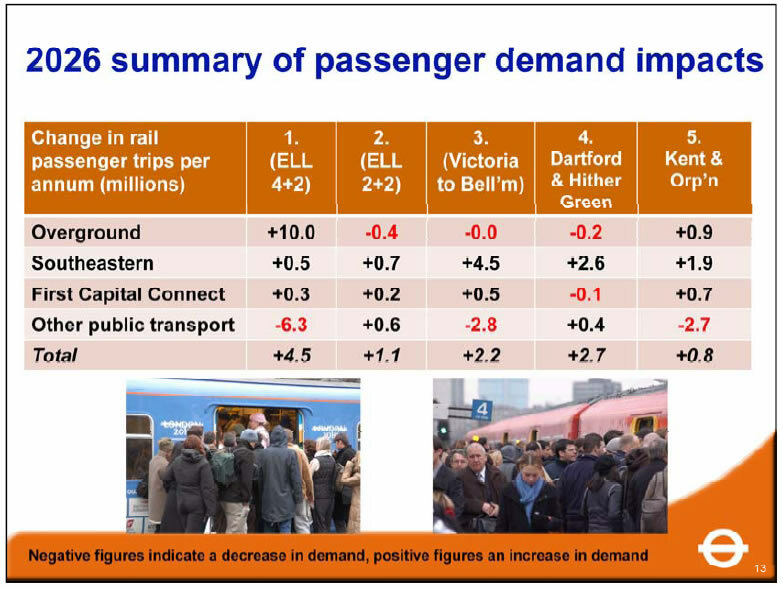 Likely to be feasible (although the study notes again that 4 carriage trains would be a poor use of capacity at Victoria). This service would be operated by Southeastern. This option would provide a direct link between Peckham Rye/Wandsworth Road and Victoria all Day. It would also provide 4tph trains per hour on parts of the Catford loop (which is currently one of the few remaining areas in London that has only 2tph). This option would likely require 2 additional units of rolling stock, and relies on an assumption that trains already serving these routes could be better utilised (if not, then obviously more rolling stock would be required). Unlikely to be feasible – possible outside of peak times but cannot be achieved in the peak without the removal of other services or a substantial recasting of the Southeastern timetable. Victoria during peaks (Hither Green service) and evenings/Sundays (additional Dartford service). 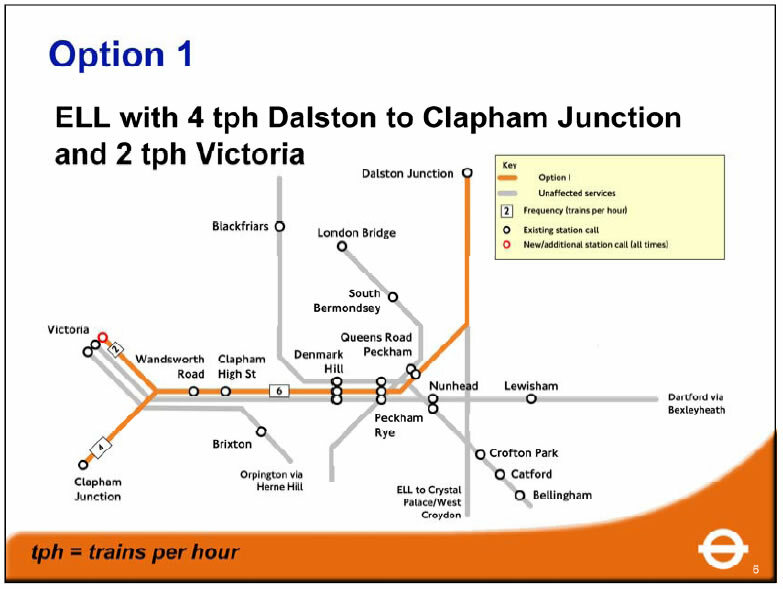 It leaves a service gap between Peckham Rye/Denmark Hill and Victoria during the interpeak period (whien services would drop from 4tph to 2tph). The rolling stock currently operating on the Dartford services is also not fitted with Selective Door Opening (SDO). As non-SDO’d 8 car units could not call at Clapham High Street and Wandsworth Road, either this would need to be installed or the a small sub-fleet would have be diagrammed specifically to the services that would be calling at those stations. There is currently no extra capacity at Lewisham – this means that running the needed Hither Green service would likely be impossible. Unlikely to be feasible. 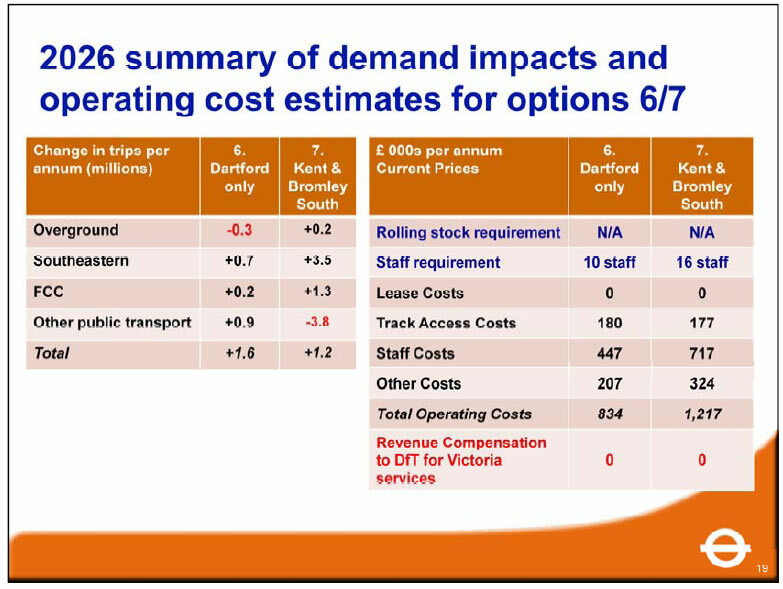 Although the extra Dartford services are feasible, the Hither Green service is likely impossible and there is the obvious issue of rolling stock and SDO. This would retain the current frequency between Peckham Rye/Denmark Hill and Victoria, and provide a direct link between Clapham High Street/Wandsworth Road and Victoria at off peak times and weekends. 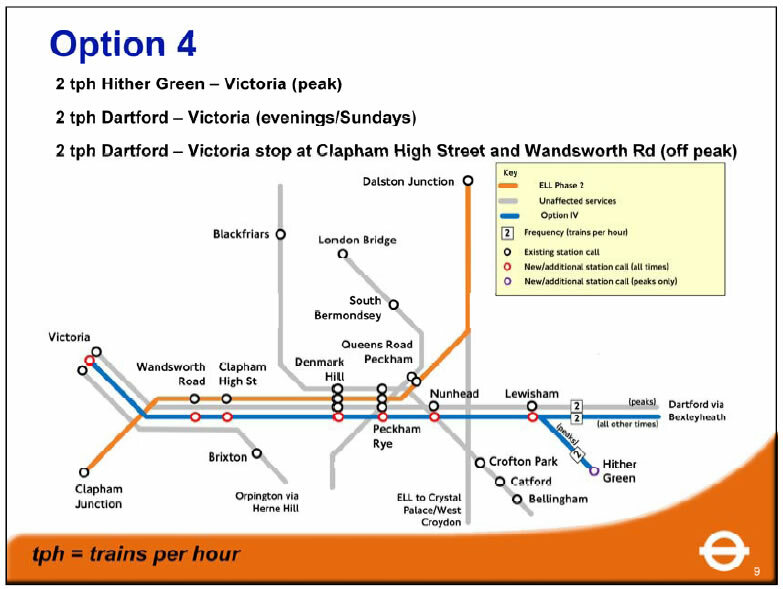 It would leave a service gap between Clapham High Street/Wandsworth Road and Victoria during peak times (as there’d be no direct link to Victoria). Long-distance passengers would see their journey times increased (although gain some additional connections to the City). 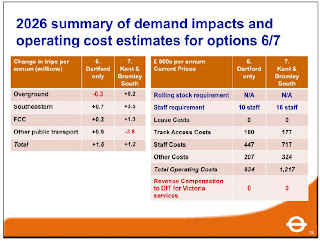 May be feasible – stopping a number of Orpington services should be considered during timetable redevelopment, and stopping some Chatham Main Line services would be feasible (with the obvious caveats listed above). With the potential advantages and disadvantages of the shortlisted options established, the study subjected them to an operational assessment. 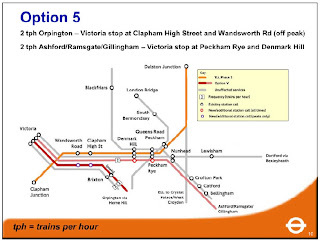 Provides a direct link between Clapham High Street/Wandsworth Road and Victoria outside of the peak, and a direct link between Peckham Rye/Denmark Hill and Victoria in evenings and on Sundays. Requires no additional trains at peak times. 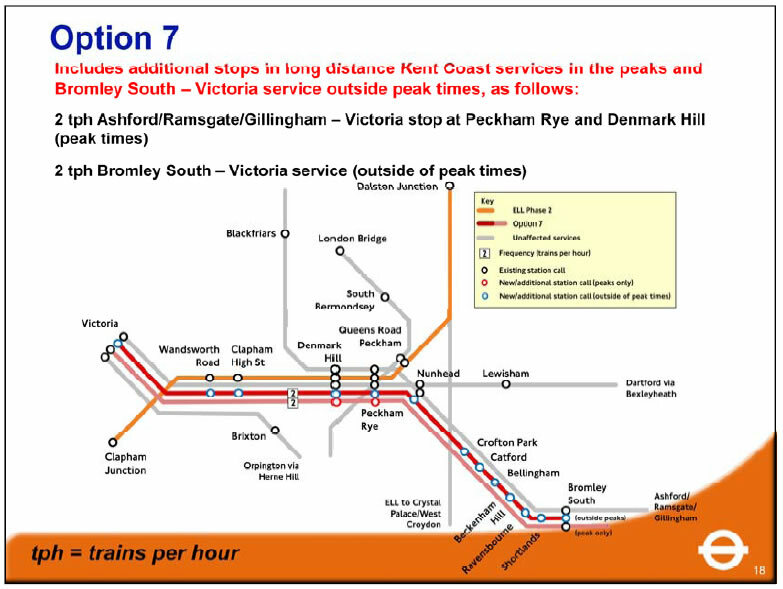 No direct service between Clapham High Street/Wandsworth Road and Victoria during peaks. Preserves current frequency between Peckham Rye/Denmark Hill and Victoria all day every day. 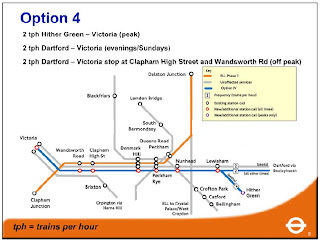 Provides direct link between Clapham High Street/Wandsworth Road and Victoria at off peak times and weekends. Leaves a service gap between Clapham High Street/Wandsworth Road and Victoria during the peak. Obviously the key question on all the options is cost. 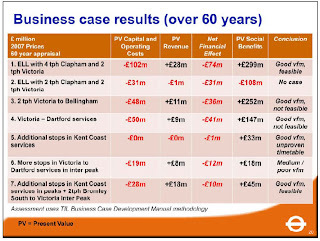 The study looked to put together business cases for each option in line with TfL’s standard Business Case assessment rules. These were costed over 60 years, and adjusted for Present Value. The Present Value calculation ensures that costs can be compared reasonably accurately even though the schemes themselves might be implemented in different years from each other. Crucially, the study looked into what funding might be available for any scheme that was taken forward. 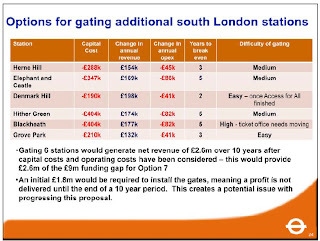 Interestingly, the possibility of gating a number of stations in South London was raised, with Travelwatch providing a list of likely candidates. 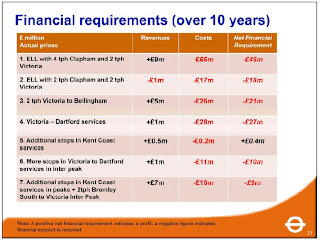 Of those, TfL calculated the financial benefit of gating the top six. 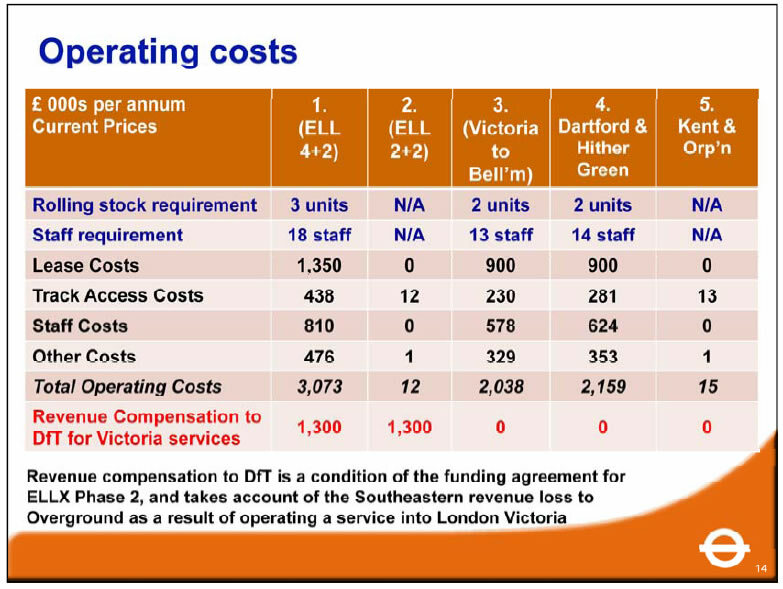 This calculation was based on the assumption that ticketless travel would fall to an estimated 5% at those stations as a result, and included an offset for the cost of gating and staffing the stations themselves. Smarter Travel and Community Rail projects were also suggested as options, but ultimately the study concluded that these would be unlikely to contribute significantly to the cost of any particular option. 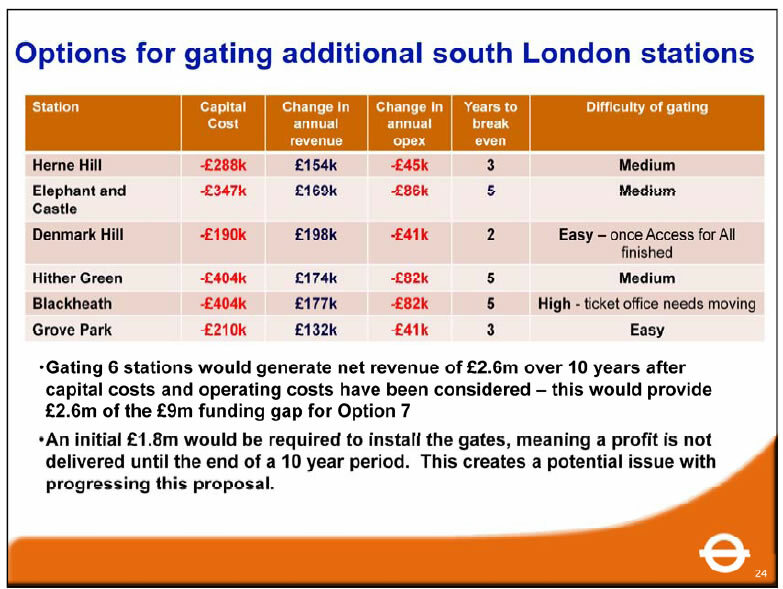 Raising the required investment (beyond the £2.6m gating would raise) via increased ticket sales to allow the implementation of Option 7, for example, would require an additional 3800 journeys to be made on the line each day – a figure that would represent a 40% increase in traffic. Such schemes would also raise the issue of how to identify and ringfence any funding that they produced. 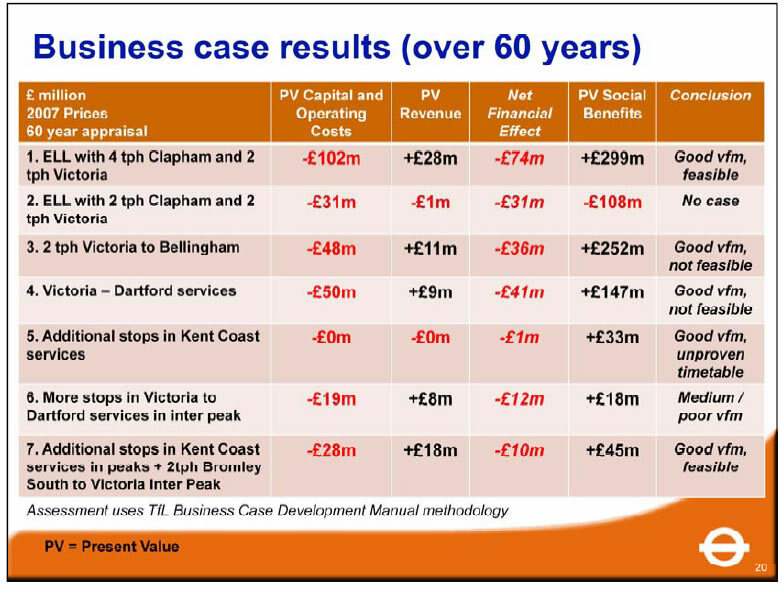 Ultimately, it appears that the study concluded that Option 7 likely represents the only realistic option for mitigating the removal of the South London Line. With TfL acknowledging that is the best of an imperfect lot, and one that ultimately fails to address the issue of a peak-time gap in services at Clapham High Street/Wandsworth Rd. The financial conclusions are also less-than-positive. Option 7 would require a financial commitment of approximately £900k a year. As TfL make clear, they feel there is little realistic expectation that they will be able to meet that cost themselves. Not only is all TfL’s funding fully committed in its current Business Plan until 2018, but the Treasury have also already indicated that the DfT will see its budget reduced by £683m in 2010/2011, as a result of which TfL must make savings of £108m. Further cuts are also anticipated. The DfT have also made it clear that they will commit no funding to any scheme put in place. Give all the above, it will be very interesting to see what happens next, particularly as more details emerge. 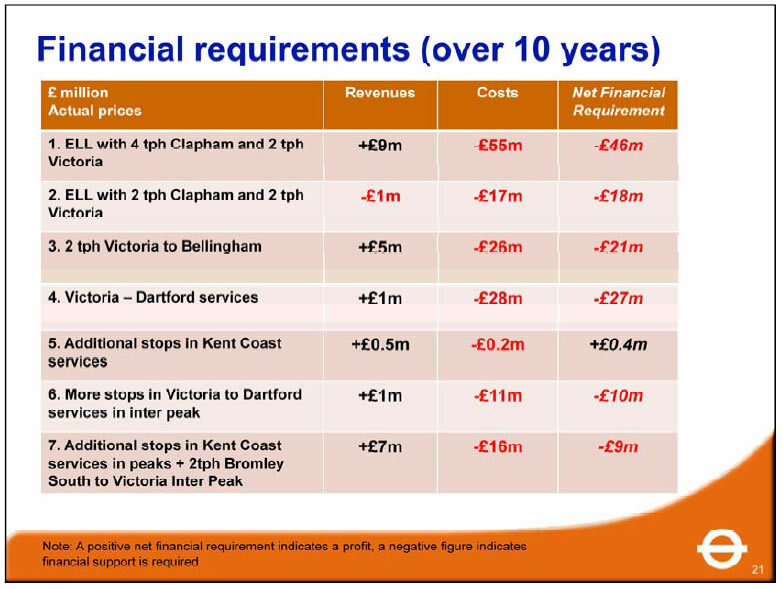 Whether any mitigation of the SLL’s removal emerges seems dependant on funding outside of the DfT or TfL being found, and such moneys are an increasingly rare beast. One final point worth considering is also this – talk has focused on Victoria as an alternative to London Bridge, but the points made by the study with regards to 4-car trains not being a particularly good use of the stations capacity are good ones. They also serve as a gateway to a possibly more interesting question – Victoria station itself is shortly to undergo its own extensive reworking, will that produce capacity (or interchange) problems of its own? Thanks to N for the spot.